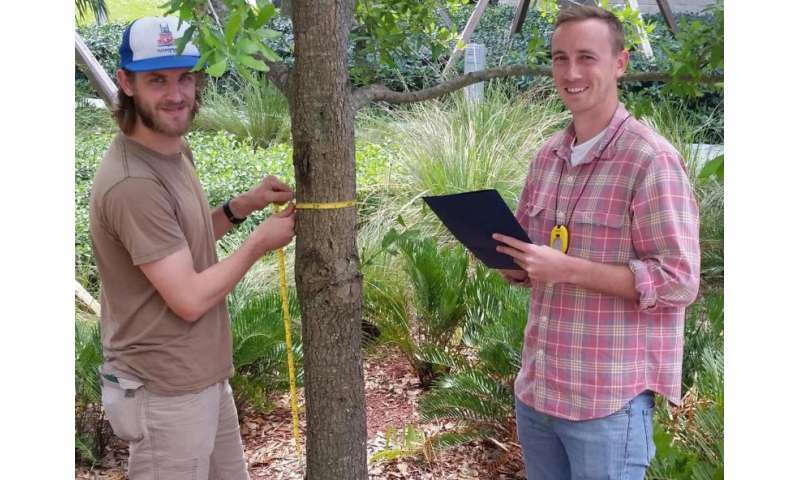 Timothy Perez and James Stroud demonstrate forestry techniques used to measure the long-term storage of carbon by trees. Changes in temperature and weather patterns pose a serious threat to the millions of animal, plant and fungi species found in the tropics. In an article published in Science, lead authors and biology Ph.D. students Timothy Perez and James Stroud explain how species found in environments such as the tropics have lower tolerances to climate change. With greater amounts of thermally sensitive species than environments found at higher latitudes, the threat of global climate change puts tropical species at a greater risk of extinction than their temperate counterparts. The article is coauthored with biology professor Kenneth Feeley. "The tropics are extremely important for society's well-being," Stroud said. "Rainforests absorb atmospheric carbon dioxide and produce oxygen, helping stabilize the world's climate. They also provide protection against floods and droughts and are a source of medicines and food. When climatic conditions change such that a species can no longer live there then it is likely to go extinct unless it is able to move to a new area where its preferred climate persists. Widespread extinctions can destabilize entire ecosystems." Perez and Stroud also identify gaps in scientific knowledge and suggest how future research may advance the understanding of how species respond to changes in temperature and climate. According to the researchers, a widespread lack of research in the tropics means much of what is known about how species adapt to temperature and climate is geographically biased towards the planet's temperate zones. "What we know about thermal adaptation is biased in that most data is derived from vertebrates such as mammals and birds," Perez said. "We are working to correct these biases by collecting data for tropical plants." Perez and Stroud are tropical ecologists interested in understanding how factors such as climate change and competition may influence global extinction rates. Perez's dissertation focuses on how environmental changes influence where plant species live and interact with other organisms. Stroud is devoting his doctoral research to studying the evolution, interactions and community assembly patterns of Anolis lizards in the tropics. The tropical species that are vulnerable are substandard and need to be eliminated like Obamacare eliminated substandard health insurance policies. Climate change is the Obamacare of evolution eliminating the unfit. These two jokers pictured here are Y2K jokes in their kid's history books. A vague consensus of "could be" and "99% real" is a consensus of nothing and the last 35 years of climate action delay and debate proves it. Were the science gods who also gave us fracking and germ warfare also only 99% sure the planet wasn't flat? Climate change "belief" was pure modern day witch burning.